In this post, I’m going to summarize the situation around drilling in the Artic Wildlife Refuge and the positions of some candidates regarding this option. A big part of the US energy dilemma is that the internal reserves of easily accessible petroleum are becoming depleted, causing a commensurate decline in domestic production. This is happening despite the National Petroleum Reserve-Alaska (NPRA) having been opened on the north shore of the Brooks Range. Although oil from that region has augmented production for many years, Alaskan production is now declining as well. The graph at right shows the petroleum production of Alaska vs the remaining 48 states. As discussed a few days ago, declining production and increasing demand are creating an ever more perilous energy situation for the United States.The basic situation updated to July 2007 is summarized below*. * If, like me, you are wondering why the inputs don’t seem to add up to the outputs, its because there are a few more inputs. See this nifty drawing of petroleum flows. Of course, the demand is not expected to let up. Rather, it is expected to keep increasing robustly. The EIA also provides extensive forecasts for petroleum production and consumption for those who are interested. If the challenge were just a matter of producing more, that would be one thing. Americans are good at that. But the underlying issue is that petroleum reserves are fixed, and so producing and consuming more just uses them up faster. Although there is continual discovery and development of more usable sources, ultimately reserves will run out. It is just a question of when. 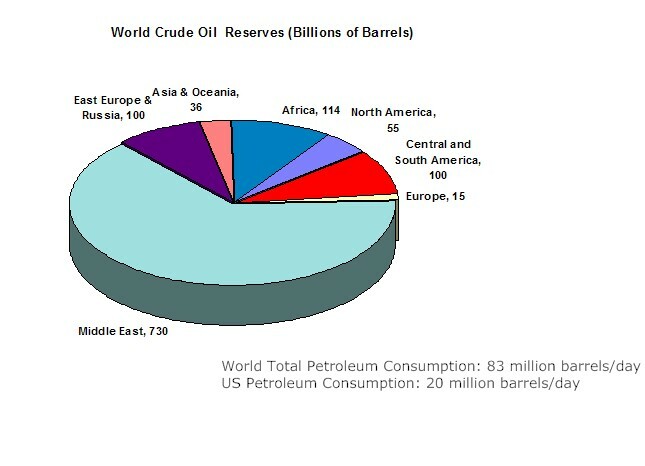 Precisely determining the amount of international proven reserves is inherently difficult and prone to error, but the world oil reserves are roughly 1.15 trillion barrels, broken down as shown in chart to the right. (Click to enlarge.) These numbers are approximates taken from vastly conflicting sources and are used for illustrating the situation only. For another breakdown on oil reserves, see here, and here is a nice world map style graphic. As a result of the continued demand and shift of supplier primacy to the Middle East, there is great pressure to find and exploit any available oil resources within the United States. As Alaska has the largest oil fields, a lot of attention has been directed there. Arctic National Wildlife Refuge (ANWR)—The ANWR is a federally protected reserve that would require congressional approval for drilling to begin. The area contains an estimated 5 to 15 billion barrels, and would hypothetically be enough to supply 100% of current U.S. demand for 1 to 2 years or perhaps 10 to 15 years if used to offset imports by approximately 5%. Allowing oil extraction in the Artic National Wildlife Refuge is the most hotly contested option for increasing domestic supply. ANWR is an area of about 19 million acres located just east of NPRA (23 million acres). ANWR is considered by most to be the last major, untouched wilderness area in the United States. Currently, there are no roads into into or within it. There are only a few native settlements. Here is a nice online book review that gives a sense of what the reserve is like. Many oil companies and politicians would like to a small coastal slice of ANWR called section 1002 for drilling. The arguments on both sides are summarized in the table below. The drilling area is only in a small region of the total area. 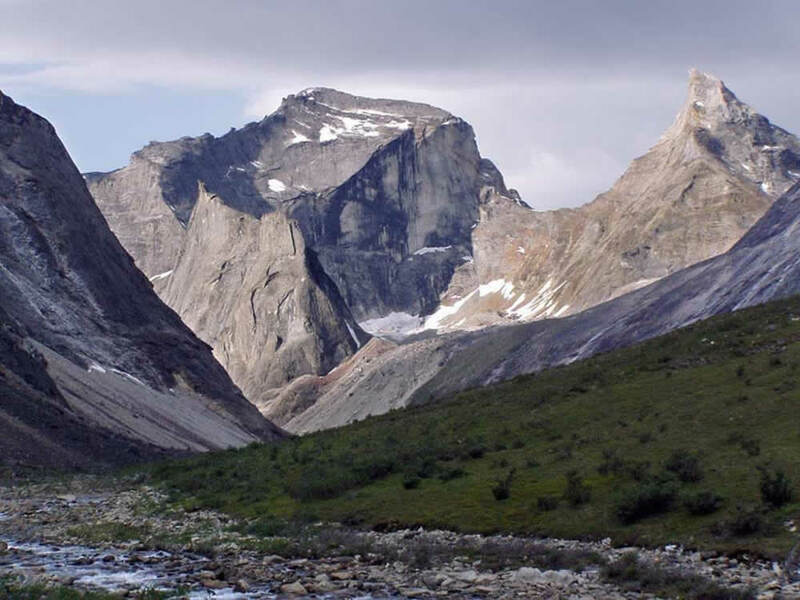 ¹ Arguments offered by anwr.org, which makes a comprehensive case for drilling. ² See this nice compilation of many sides of the issue by the University of Connecticut. Also, the Sierra Club presents the against side of the issue. There are a couple of common “against” arguments that I did not include in the table because I consider them to be logical fallacies. In the interests of fair play, I give them below and my response. People who make this argument assert that if ANWR is opened up, then opening up other protected areas will follow. Some even argue that breaking down the federal protection of refuges is the goal of corporate efforts to open up drilling in ANWR. But this argument is a slippery slope fallacy, because the cause and effect linkage between the authorization for drilling in Alaska to authorization other places is extremely weak. Although I suppose a type of precedent might be set, obtaining additional authorizations would likely involve a complicated series of legal moves in different conditions and circumstances on a case-by-case basis. It would not be guaranteed, and there is no reason to believe that those decision makers would feel more inclined to open up more refuges versus feeling that an exception was already made and that sufficient latitude was already given. The table below lists the positions of the top 2008 presidential candidates. As one might expect, Democrats tend to be opposed to drilling in ANWR, and Republicans tend to be a less unified. The essence of the ANWR issue regards whether it is worthwhile to take a chance with one of the remaining pristine areas on the globe to satisfy relatively short-term needs for oil. The drilling would probably cover only small percentage of ANWR, but it would still be a sizable area of land that would have drilling rigs, roads, and other support structures installed. Undoubtedly there would be some environmental damage, but how much is uncertain. Similarly uncertain is how much oil would be recovered and how much that oil would actually help the economy. We must balance how much is it worth to preserve this last-of-a-kind area versus the need to relieve pressing demands for oil now. I am using this post, “Overview of Drilling in Arctic national Wildlife Reserve” as a resource for a paper on ANWR I’m writing for college. I was just wondering who posted this so that I can write a satisfactory bibliography/works cited entry. Thanks.